This is a sequel to the prevous Home Alone platformer. 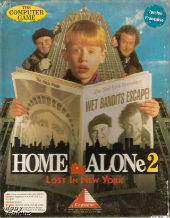 As in the film of the same name, this Kevin McCallister is lost in New York and must avoid the criminals Harry and Marv through 4 levels of gameplay. This version comes con a set of weapons to use against the thugs like the super somersault or the punch gun.